Welcome to Piggy Farm, the latest ABO addition, released in February 2017! The first level is fairly straightforward and obvious, but my take some work to eke out that high score. Simply toss Stella up high to pick up the three rocks and as much of the structure as she can, and rain debris on the level below. The score in the video is 99010. @bernersenn Thanks for your efforts. You’ve got a lot of work ahead. If you get stuck ….!! @steviep147 thanks. But also many thanks to @mighty-red-1 and @birdleader. Yes Thanks to all @bernersenn , @birdleader, @mighty-red-1 and @knichy great team effort!! @mg516 score registered, thank you. Is the golden pig balloon important? Besides using eagle, haven’t managed to pop it yet. I now managed to pop it. But it didn’t do anything at all. Didn’t see it properly, but doesn’t even seem worth a lot of points. @cams how did you manage to get that Golden pig balloon? Do you know how many points it gives? You should post your scores on the leadeboard, great fun and friendly competition, also helps you strive for higher scores ? Stella to pick up stuff under it and hoping to pop it. Due to all the debris, it was hard to see its score (if it even has one). But if it was important, there would have been a big, colorful number right? If I could magically upload all the latest scores for the hundreds of levels of the 6 games I have. I would. But manually uploading everything, and even bothering to update them? No thanks. FYI – a little trick on the dailies. If you use a PU but purposely get a low score and clear the level, you get a “New Highscore” and lightning bolt on the tally, but no perpetual companion. Then you just have to beat that, with or without a PU to claim your reward. And you don’t wind up with that second score unless you beat your “regular” score with a PU. I use what we call the “bottom feeder” PUs like the sling scope, get a low clearing score, then just beat it. @Cams and once you clear all the pigs fling you’re extra birds backwards to avoid the 10kbonus per bird. I know these are new levels but has anyone gotten 100% on Level 1 yet? I’ve been trying and can’t get past 96%. Thanks for all the great video walkthroughs! Got it!! On to Level 2 !! Anyone else thinks this level is tough? I 3 starred It but really struggling to improve my score. Uhmmm ya @th22 Wayy tough!! Following the video without much luck!!? This level has been so frustratingly random. R&R and hope. Finally got my above average score when the trailer went LEFT. How’d ya make the trailer go left @captrec ? Kk thanks @captrec lol? I’ll pray to the AngryBirdsGoddess for some Awesome randomness heehee!! Thanks b for the great tip ?? I can see this is going to be another one of THOSE sets of levels. I ground my score on this one higher and higher until I thought for sure it was well above average. I came to post it and found out I was only a few hundred above…argh! I would like to see some pictures of these high scores too. How’s about @bgbuk? I don’t know how it was done, I don’t cheat in any way. I’m not that smart just like playing this game. How do I show a photo of my score anyway? JUST TO MAKE EVERYONE HAPPY, I LOWERED MY SCORE TO 89th PLACE! @bgbuk, I believe they where just asking for screen pic for first place. That is a pretty normal request here at the nest. Don’t be upset because they asked for proof, they ask this of everyone for top place. Need screen print proof and strat used for top score trophy or to earn puppies with daily challenge. I just realized at the time my score might be in the top 10, so I grabbed some screen prints just in case it was needed. I know in ABO it doesn’t show the “lightening bolt” if power-up was used after you leave the score screen (like seasons does). Unfortunately when you revisit the level in ABO it just shows your score with/without power-up symbol. Too bad Rovio hasn’t updated other games to show scores like ABS seasons (with the two scores showing if power-up was used). It is just harder to prove later (after the fact) in other games beside ABS (seasons) that power-up was not used. Maybe since I have screen pics proof of the possibility of these higher scores, it might help you to regain top place? You scored about 1k higher than my score, so I would believe your score is within reason of my second place score. Why don’t you post your screen pic here and reclaim first place? @admins? Congratulations on top score trophy! So, please enter again your own score. In the jpg you posted for bgbuk there is a red bird just to the right of the power up black bird with 44 underneath. I have no idea what that red bird is about. Can you enlighten me on it purpose and function? I am not sure I have ever seen that item previously on any of my screens. @wrw01 I can’t explain it to you yet, but will discuss it with the other admins. @wrw01 @bernersenn @mighty-red-1 Yes, it was a charity sale, for only about two weeks, Nov 2014. For $2 you got a Red’s Mighty Feather as a free PU. You can only use it once per game but it lasts forever. There was also a RMF Golden Egg that came with it. When I first entered my score I was in second place, came back later to see I am now in first place. Fortunately when I saw the score after fling I had a feeling it would be among the top 10 scores, so I did some fast screen prints just in case I needed to show proof of my score. At first it wasn’t needed as I was in second place, but looks like now I will need the pics, Glad I thought to capture the pics at that time! So, I used the same strategy as most above. I just keep flinging first bird to the top three stones, hoping to get good lift and fall out below. I didn’t do any thing different, just kept flinging until I got decent score. I think it is just a matter of R and R and luck? Here is a screen pic of the angle of the first bird and aftermath. Had pending score of 96,960 with two birds left. I’m sorry that I was so taken back by the high score request for proof, but I don’t record any of my games and won’t add anyone that is really to high to be true. As i said before I don’t cheat and wouldn’t know how to anyway. I do think on the friends tournament there are and don’t get caught. Most of the time the ones that swoop in and grab the highest spots aren’t even on Birds Nest to put in their scores.Thank you. I changed my score back and someone said they added my photo to prove the score was real. Thanks again and I won’t stop popping those PIGS….. I don’t record either, I don’t have the capacity to record. But as I said above, I look at the top 5 listing, just before comments, I just take a screen print if I think i have a score in the higher range. After I go to enter my score and it is not at least in the top five I will delete screen pics. I haven’t played the “friends” yet, but I know what you mean by the others, I see supper high unrealistic scores in the “Game Center”. The only real cheats here on this leaderboard would be using power-ups (not allowed). Must get your score by your own skill (or luck in some cases). Glad you re-entered score and the admins accepted your pic. It is always nice to have a top score here or there! Congrats again. @diannas and @bgbuk. I did not intend to imply that any of your high scores were false and if it seemed that way then I apologise. What I wanted to see was the trajectory of the high score shot (s) and the resulting damage. Such screenshots are invaluable. Thank you Ladybird for sharing your pictures. @stevep, no worries, I never thought that you were questioning my score. I think your comment was there before I entered my score. I was defending the requests for screen shots and stat used hoping Byrdman23 realize this was a very normal request. At the time his score was posted, it was much higher than second place and questionable. But once I hit my higher score (just 1k less of byrdman score with screen print proof), plus I think shortly after a third place score of 116k was entered (also within ballpark of top score) help byrdman to have a more believable score. Just so happens, I thought my score looked high so I had the rare presence of mind to grab a screen shot before the level ended. I don’t know if my pic of angle helps or not, I was just flinging the bird to top rocks hoping for a good fall out. Looks like I might have come in a little high and bird dropped down into the rocks? Just got back from Vegas. On the last day just before leaving for airport, we were took one last chance on a “Wheel of Fortune” slot, we won back enough on to cover all the dollars we spend on the slots for this trip. Broke even at Vegas, no bad!!!!! feeling pretty lucky! ? This level is frustrating the heck out of me. I can’t even break 105K…well below the average here. I think this may be one of those levels that is a lot easier for iPad/iPhone users than Android. I see that the vast majority of the top scores are on the iPad/iPhone, but there is one Android user that got 112K. Are any other Androids users getting shut out here? Just to add…I can’t even see the full structure fully zoomed out. The top of the structure is cut off. I know what’s up there because I’ve knocked it down, but otherwise I wouldn’t have a clue. I see the post of an iPad screenshot shows a lot more than I can see on my screen. What I found to be different is the way the bird rolls across the three stones on the left side of the upper structure. The bird tends to sit higher as compared to the adjacent structure on the iPad. This allows one to get more pieces lifted and thus it is easier to clear more of the upper structure. I haven’t gotten a new high score yet as I haven’t spent much time working this on the iPad, but I have been getting a lot more 100K+ scores than I did on the Android. So Android users beware, I believe you are at a disadvantage on this level. Comparing your screenshot with the scene on my Android tablet I noticed a difference in screen aspect ration, yours is 16:9, mine 16:10. Left, right, bottom are the same but the upper part is cut off on your screen while fully visible on mine. 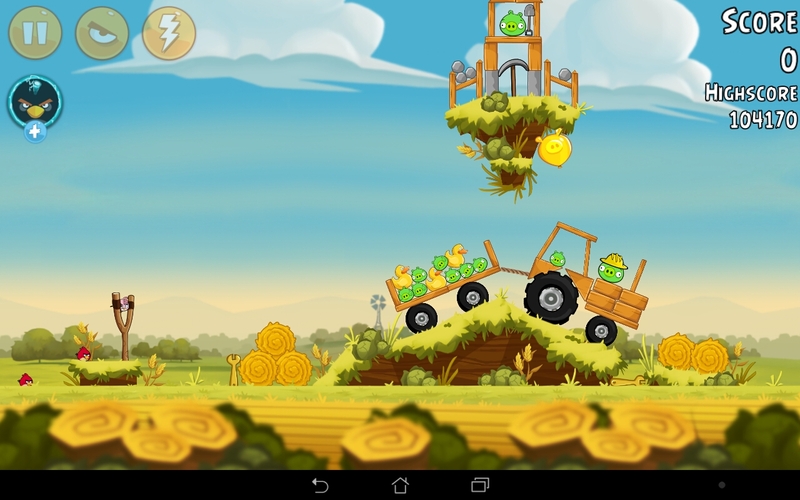 Maybe you want to contact Rovio about this issue, it seems their programmers have ignored 10:9 screens on this level. Thanks also for your report about the difference in difficulties depending on the platform. I spent most time of all PF levels on this one – to get finally just over average. I think I’ll never touch it again. 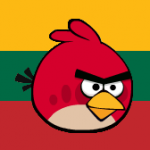 It looks like Rovio addressed this issue with a recent update. I can see the whole structure now. can’t say anything about platforms, but i can say that the level was tweaked (in the piggy farm lvl 16-30 release, compared to the lvl 1-15 release, both ipad hd): the low structures holding the small stones, left and right of the top structure, used to be unstable, move around a bit (when starting the level). now they are rock solid. they used to move around only a little bit (once had the left one fall off, but then my 1st was already in the air), and don’t know how it affects scoring or whether there were other tweaks, but gameplay is different. the 1st very much depends on hitting the small stones just right (although i don’t know exactly what that means here; not much of a strategy involved, just R & R). already a pixel makes a lot of difference. one could easily test how different by installing both versions and doing some experiments. Coming late to this party of levels…cannot obtain an average score. Launched Stella to hit the top stone and roll to the right to rest on the wood. Lifts the entire structure and had two stone blocks remaining. Can replicate the shot often with an aiming cue of the tail feathers and plant behind the sling but the travel of the tractor and cart are the unknowns. Many flingers with many more points so I must be missing something with this level. Tried all the birds but there is something I am not seeing or they changed something as mentioned above. @wrw01 I’ve come back to this episode to get my scores above average. I don’t think you’re missing anything; I think scores just comes down to pure luck. @vuelva mentions above that the levels might have been tweaked. I know that’s the case for Level 0-8 in the Tutorial episode. That’s changed so much since it was first released (and before I played it) that I don’t think I’ll ever get above average now. For those of you who can’t get to an average score, I have felt your pain. However, I am now a bit above average. So, try my method. I launch Stella with her tail feather barely touching that plant on the launching platform, specifically the second leaf/flower from the right. Up on the platform, I look for Stella to push the top left stone a bit up the side of the top right stone. Hopefully Stella herself will then roll over the top of the stone and just as she does, activate. You don’t want her to settle in on the other side of the stone, she has too be pretty high when activated. Done properly, this will get you some good lifting, and eventually you will likely get an above average score. Happy flinging! @jrsquonk Thanks for the tip! I’ve lost track of the number of hours I’ve been stuck below average now (currently at 103140). It isn’t much but I’ll take it!